Internationally popular music streaming outfit Spotify has released an infographic which illustrates some interesting statistics since last year's U.S. launch. The Swedish company is celebrating its first anniversary in America and by all accounts it looks like a success chock full of big numbers, impressive percentages and big bucks. If you haven't taken a look at Spotify before, it's a $5/month all-you-can-eat streaming music buffet -- it's $10/month if you want mobile access. Users can listen in for free as well albeit with a few restrictions. The service boasts over 18 million tracks and 20 million users world-wide, certainly making it one of the most popular -- and profitable -- destinations for streaming music. Spotify occupies the same turf as Rdio, Grooveshark and Mog. According to the company's figures, its users have listened to more than 13 billion songs, accounting for more than 2,700 years or roughly 23.7 million man-hours worth of listening enjoyment. Spotify users have shared 27.8 million songs with friends while more than half (55.3 percent) of those users shared tracks through Facebook. 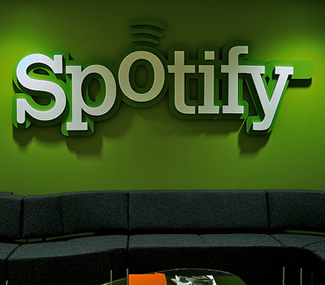 The remaining majority (41.5 percent) were shared via Spotify itself while Twitter weighed in as the third largest sharing outlet around 3 percent. Spotify introduced itself to the U.S. with some degree of exclusivity last summer, opening its doors as an invitation-only music streaming service to U.S. customers. Toward the end of September however, Spotify opened its gates to all Americans with a free, 6-month, all-you-can-eat trial subscription. Much earlier this year, the Swedish company reported that it had net more than 3 million subscribers in 2011 with 20 percent of those users becoming premium members.